The take away: Location-based social networking is about “assisted serendipity” – using technology to turn an otherwise chance encounter into a real business opportunity. 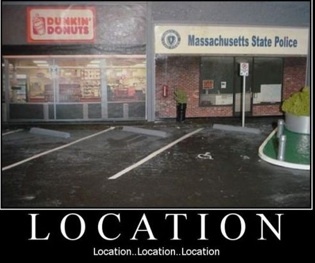 Location-based social networking (LBSN) applications are becoming quite popular. They are not entirely new, however. Here’s a nice list of LBSN sites – some of which have been discontinued, including the Google-owned Dodgeball (replaced by Google Latitude). The most hyped LBSN app is Foursquare. If you follow me on Twitter or are a Facebook friend, then you know that I’ve been experimenting with Foursquare for several weeks now. Users can view details about nearby places, including tips left by previous Foursquare users (e.g., “Try the bacon cheeseburger…”). Users can also see who else has checked-in recently. Local businesses take advantage of location-based data to help lure customers with special offers. For example, on a recent trip to The Shops at Columbus Circle in New York, the nearby Tasti D-Lite shop “noticed” I was there and offered a discount on an ice cream cone if I stopped by. There is also a “game” aspect to Foursquare. Users collect “badges” and points for various activities like checking in to ten or more locations in a week, or for checking in to different types on places. My favorite is the “Jobs” badge (awarded for checking in to three or more Apple Stores), which entitles you to a free “iHoverboard” if you show the badge to an Apple Genius at the store. Foursquare also lists the times and locations where your friends check in. If you’re really in to it, you can get an alert every time someone checks in to any location (I don’t recommend this because it will drive you crazy – especially if your Foursquare friends are active users). Finally, you can opt link your Foursquare account with your other social networks so that your Foursquare updates appear on your Facebook wall or in your Twitter stream. Fair warning: this might irritate your Twitter followers and Facebook friends – especially if you’re an active user – because they will be inundated with messages like “Patrick just checked in at the Apple Store…” all day long. Rather than setting Foursquare to automatically update your other networks, set it to prompt you to choose whether to do so on a case-by-case basis. OK….so why would I want do that? Do you want to let everyone know where you are all the time? Probably not. But that’s not the question. The question is: Would you like a unique opportunity to connect with your contacts — in real life? 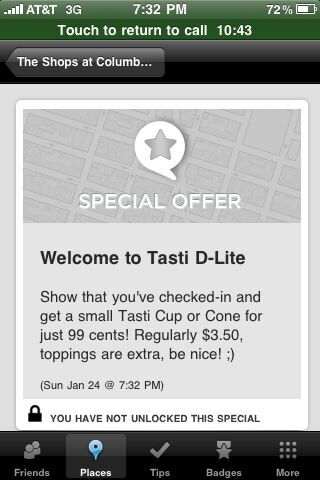 Location-based social networking is not about restaurant recommendations, or discounted ice cream, or badges. It’s about “assisted serendipity.” Never before have we been able to help along a chance encounter, or to take advantage of an opportunity that we didn’t even know existed. For example, let’s say you’re traveling and have some time to kill while you wait for your flight at the airport. Little did you know, one of your contacts–a business prospect–is there too. You might happen to run into your contact, but given the conditions (the size of the airport, the number of people, etc.) the chances are slim. More than a mere catalyst that simply hastens an inevitable chemical reaction, a LBSN, like Foursquare can create an opportunity — turning a potential chance meeting into a sure thing. So, will you use a LBSN application, or is it just too much too soon?